I’m 44 today! Some looked to me apologetically this morning and whispered ‘ Happy Birthday, kindly keeping the ‘secret’ from others at the school gate, whilst others offered me a ‘way out’ – ’21 again today eh! ?’ and some, like my oldest son, kindly pointed out that I am just 6 years from 50 and therefore almost half way through the abacus of life! ‘Happy Birthday Mum! 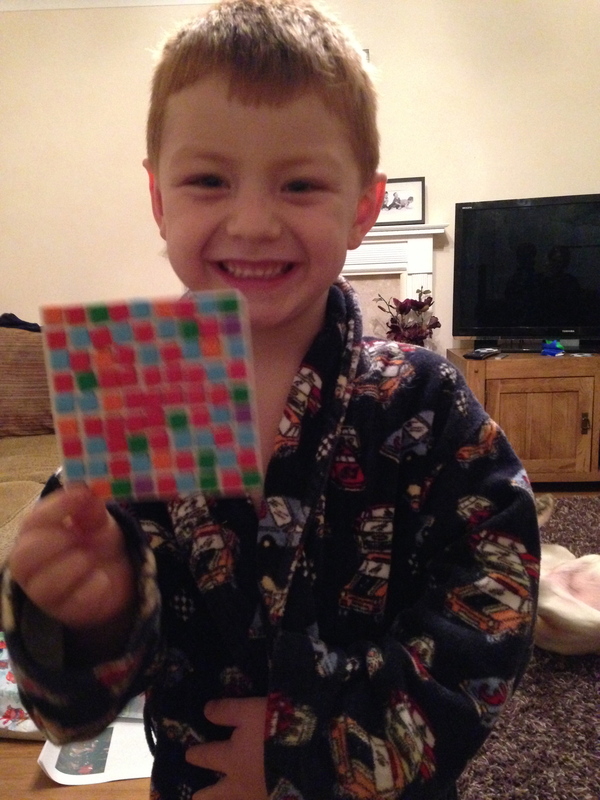 !’ he grinned, presenting me yesterday’s coaster made from wonky foam mosaic squares. ‘No, it’s a frisbee!’ at which point he demonstrated how well it flew and so my birthday began! Do not be fooled as you raise your boys that you are safe. Even on the morning of your 44th birthday. 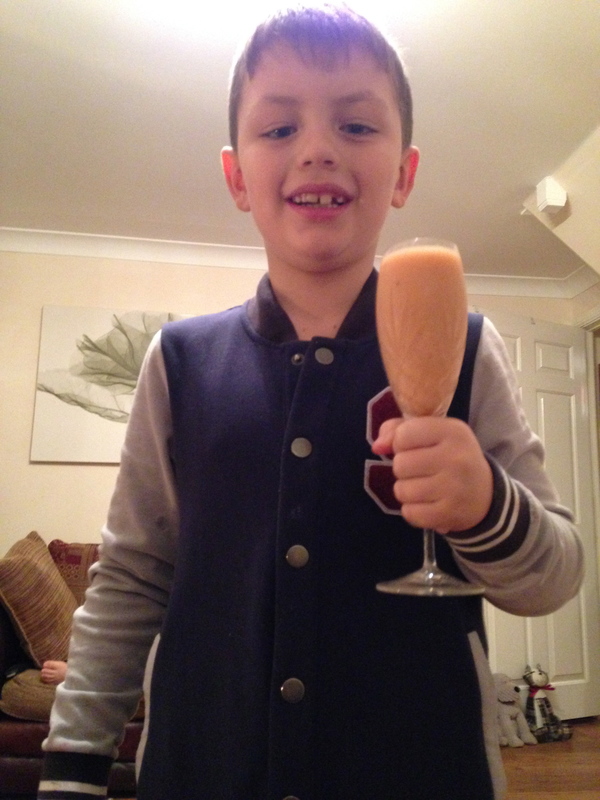 Jack (8) made me a fruit smoothy (and destroyed the kitchen in the process). ‘I’ve used my bullet!’ he announced proudly. I am sure that it was the danger wrapped within the name ‘nutribullet’ that led him to put this miniature model of the London Shard in his Christmas list! It was served in our last remaining crystal champagne glass! Every birthday we get it out for the child celebrating – and today it was my go (a big kid)! Every year, it balances precariously on our breakfast table, only today it didn’t. As I turned to stop a paper aeroplane envelope from flying into the fire I knocked it, smashing it neatly into three sections! Jack, the pilot of the plane, burst into a flood of tears. He is sensitive at the best of the best of times, and the memories attached the glass mean more to him than most. We sat down together, in the middle of our wrapping paper mountain, and I told him the story of my amazing Nanna Judy…She’d been given three colourful pyrex bowls as a wedding present in the 1920’s (how times change!) they’d travelled with her when she emigrated to Canada and back to England when they returned to their homeland. As a little girl I’d made her a jelly and accidentally dropped one of bowls, smashing it to smithereens! I froze in terror and was shocked to see her throw her head back and laugh… not angry at the smashed china, but tickled by the jelly in Grandad’s slippers. ‘Things aren’t important’ she’d said simply. ‘You can’t take them with you when you go’ she added. And how right she was. I told Jack the same thing this morning and we laughed at the ‘new crystal cup’ that we’d created! We decided to keep the top part and, each year, from now on (until we smash that!) we’ll remember the lesson that their Gt Nanny taught their clumsy mum that I in turn, shared with my children. As a mum of boys I have a spectacular collection of repaired frames, armless ornaments and now, a stemless crystal glass! All of which will be priceless reminders of the days we were raising boys! 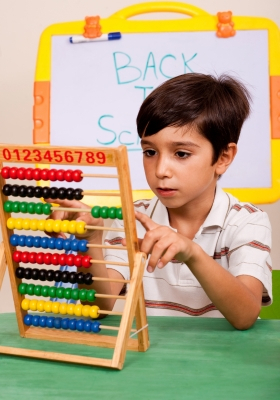 Photo Credit: Thank you to freedigitalphotos.net for the photo of the little boy with an abacus. ‘Mathematics Lesson’ by photostock. ← Planes, Trains, Automobiles…and sleighs!